What is a fully dressed Daisy Girl Scout? It is a Daisy who shows her Girl Scout spirit through her appearance; she is telling the world that she is a Girl Scout Daisy! From her Daisy Tunic to her Daisy Girl Scout Smile, she is showing her friends and her sisters that she is ready to learn all there is for Daisies to learn. 1. DAISY TUNIC: Allows a Daisy to display her accomplishments and stay clean. 2. AMERICAN FLAG PATCH: The American Flag Patch represents the USA flag. 3. DAISY COUNCIL ID STRIP: Shows what council a Daisy belongs to. 4. 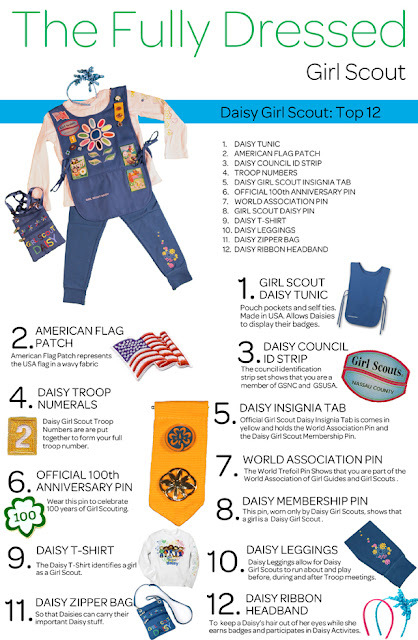 DAISY TROOP NUMERALS: Shows what Troop a Daisy belongs to. 5. DAISY GIRL SCOUT INSIGNIA TAB: Holds the World Trefoil Pin and the Daisy Girl Scout Membership Pin. 6. OFFICIAL 100th ANNIVERSARY PIN: Wear this pin to celebrate 100 years of Girl Scouting. 7. GIRL SCOUT DAISY PIN: Worn only by Daisy Girl Scouts, shows that a girl is a Daisy Girl Scout. 8. WORLD ASSOCIATION PIN (WAGGGS Pin): Shows that you are part of the World Association of Girl Guides and Girl Scouts. 9. DAISY T-SHIRT: Identifies girls as a Daisy Girl Scout. 10. DAISY LEGGINGS: Allow for Daisy Girl Scouts to run about and play before, during and after Troop meetings. 11. DAISY ZIPPER BAG: Holds important Daisy stuff. 12. DAISY RIBBON HEADBAND SET: To keep hair out of a Daisy’s eyes while she earns Daisy badges and participates in Daisy activities. Remember, for all your Girl Scouting Merchandising needs… visit your local Girl Scout Shop. I am a member of the Girl Scouts of Nassau County Hispanic/ Latino Task Force. I want to tell you why I belong and encourage others to join me in this work. The Girl Scouts of Nassau County Hispanic Latino Task Force is the definition of hope to Latina girls. The opportunities are limitless and helps to cultivate confidence and character in the young Latina woman. Girl Scouts helps youth to identify and cope with everyday challenges such as peer pressure and bullying. Girl Scouting provides and promotes guidance through the educational system as well as career development. The Latino Task Force breaks down barriers for average Latina girls, and allows them to be themselves and execute their talent and skills. As a Latina Girl Scout, I have learned how to become independent despite challenges I may have faced in middle and high school. From participating in workshops about believing in yourself to learning table etiquette and public speaking, to getting to travel and meet other girls from around the world, the Latina Task Force became my second home, and allowed me to grow with confidence, respect, and accountability. Long term goals became my check list as I planned commitments for action. All the while having fun too! In Girl Scouting, Latina girls are challenged to be the best that they can be, execute the best of their skills and to be comfortable in their own skin. Every girl has a story and a chance to improve the world. College, scholarships and internships are just a few opportunities a Latina Girl Scout will be offered. The best opportunity is learning about cultural diversity and the power of girls together. We are holding our first meeting of the new Girl Scout year on Thursday, October 11, 2012 at the GSNC offices located at 110 Ring Road West, Garden City, NY 11530. The meeting starts at 6:30 pm. Come and join me! To provide on-going guidance to GSNC in reaching out to ALL Hispanic/Latina girls through programs and events. To encourage Hispanic/Latino businesses and community members to support GSNC by volunteering with the efforts of programs in our underserved and under-represented areas of Girl Scouts. To increase the number of Latina girls and bi-lingual leaders participating in classic Troops and Pathways Series programs. To engage Latina Girls in Girl Scouting and to educate all girls about Latino culture and heritage through community and council wide programs. 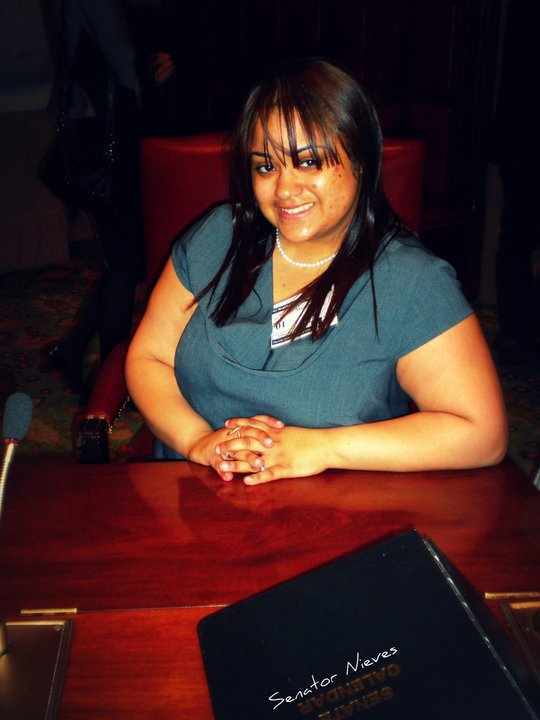 Guest Blogger, Rhonda Nieves, Gold Award Recipient, graduate of John Jay College who is currently working on her Masters in Public Administration and Law.